I made myself a top and skirt using the Sewing Cake Tiramisu pattern. It was very easy to hack, especially as I have made it twice before. For the skirt I made a waistband and attached to the skirt pieces. I added in a section at the back that was gathered with elastic threaded through chanels, which gave a bit more stretch at the back – it is still a squeeze to get it over my hips so next time I will make the elastic gathered section longer. For the top I made the bodice up as normal and instead of the waistband, I made up a bottom piece using the bottom part of the Cabarita pattern, essentially though you just need to lengthen the waistband piece of the Tiramisu and taper it out to your desired hip measurement at the base. I used a very lightweight jersey from fabric.com (no longer available) – I was thrown as when I ordered it I thought that the stripe and rose was about a quarter of the size than it actually is. It’s very bold! 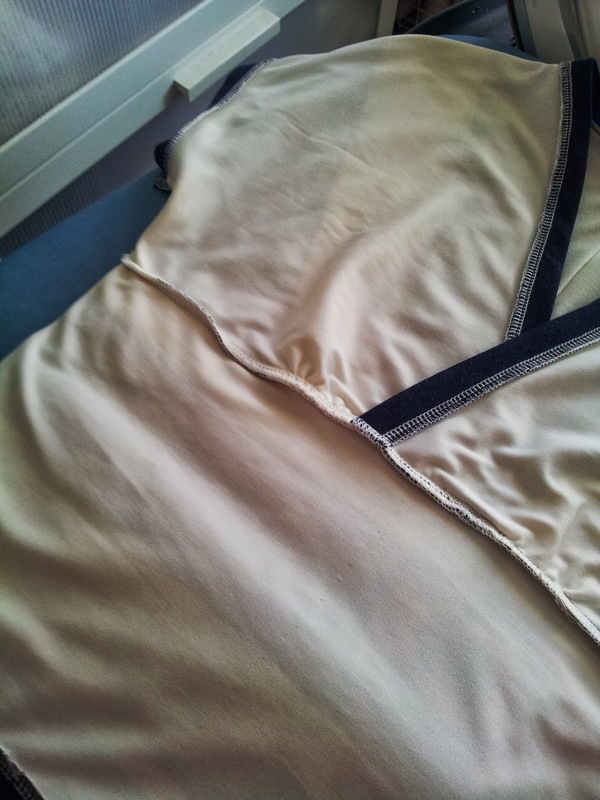 I also needed to add a lining so I used some cream stretch stuff from my stash (a remnant from Pitt Trading). The skirt is lined and the top is mostly underlined – I couldn’t decide whether to line or underline so its a strange combination of both, thankfully it works. The lining was really worth the extra time – it feels lovely and weighty to wear – it really improved the fall and drape in addition to making it not see-through or clingy. The leaf up on the neckline? 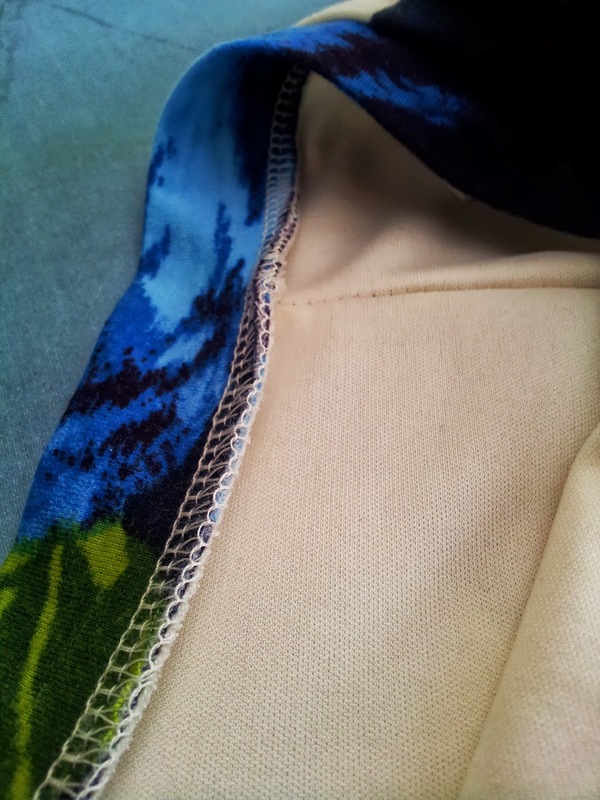 That’s an applique covering up a hole in the fabric – I think I made it when using the sewing machine thread cutter. Boo. Pattern matching and placement took me forever, I didn’t have much fabric to work with for the exact layout I wanted but I am mostly pleased with how I managed to position the huge flower motifs. The guts of the top showing the lining. 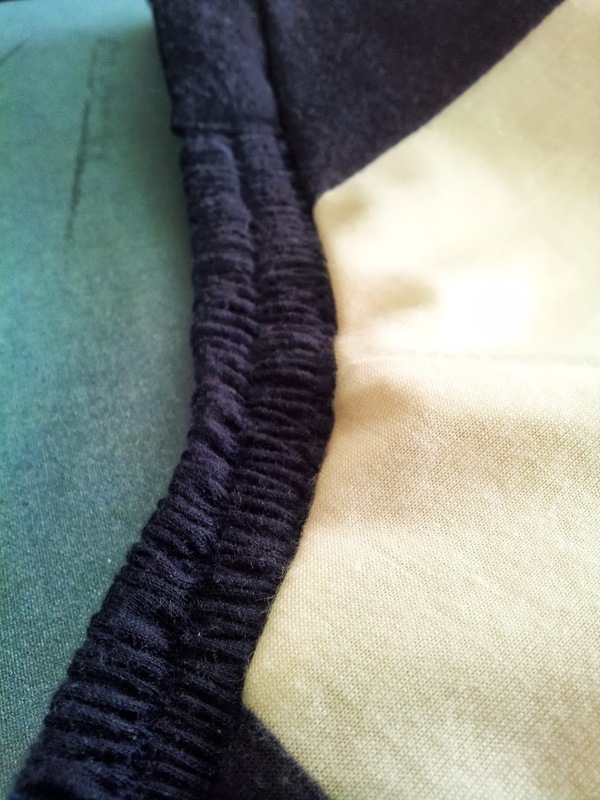 The gathered bit on the back of the skirt waistband – two 1/4″ strips of elastic threaded through channels on a separate section of waistband, and then the ungathered part of the waistband was attached by top stitching to neatly enclose the gathered section. Probably there are better ways of doing this but this method worked really well for me. I love that I made this as separates as I can also wear the skirt with a solid print top, namely the Cabarita, also by Sewing Cake. I’ll post about this probably in a day or so but here is a picture for starters. Jackie Coat Sewalong - Bagging the lining!